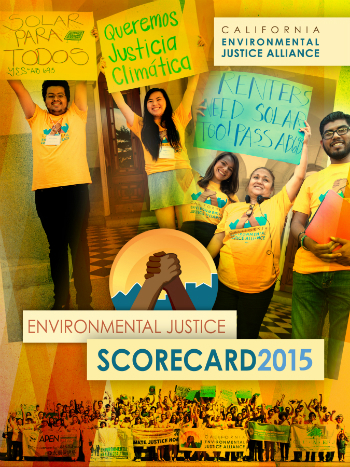 Read our full Environmental Justice Scorecard 2015 here! 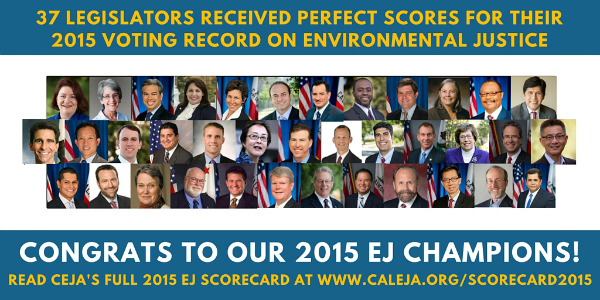 CEJA is proud to release our 3rd Environmental Justice Scorecard for the 2015 Legislative Session. 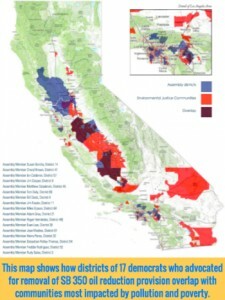 This scorecard is the only one in the state to assess how well California’s elected officials supported actions to address environmental issues that impact low-income communities and communities of color. 2015 was a momentous year for the EJ movement and there is much to be done in order for the victories of this past year to lead to health and environmental improvements directly in our communities. With five ground-breaking bills passing (AB 693, AB 1288, AB 1071, SB 350, SB 673), the results of the legislative session are a testament to our movement’s growing power over the past several years. 2015 was also a year when industry flexed its muscle. The oil lobby spent $11 million from July to September alone, fighting off ambitious attempts to reduce our state’s dependency on fossil fuels. Sadly, many Democrats joined industry instead of standing for measures that would have undoubtedly improved health for their constituents. See map on the left. It is unacceptable for Moderate Democrats, many of whom represent predominantly people of color that are most impacted by climate and dirty energy, to hide behind concerns over equity and fail to take stands on measures that would undoubtedly improved the health and quality of life for their constituents. The increasing reality is that for environmental legislation to be successful, it must include the issues that communities of color care about. From the floor debate to the committee hearings, the impact of a proposed bill on low-income communities and communities of color often took center stage in 2015 debates. People of color are the majority in California and we are showing, through our votes and voices in Sacramento and throughout the state, that our communities and our issues matter. Interested in hearing more from CEJA on the 2015 scorecard release and some of the key environmental justice issues for state policy in 2016?